The Hastings City Celebration Awards (formerly the Hastings City Business Awards) are held annually to celebrate and award Hastings' most successful and inspiring businesses across ten categories. Simon from SCP Photography was asked to be a category sponsor and also cover the event on the 17th of August 2018 from 7pm, held at Albert Square inside a massive 20m Geodome marquee, which has a capacity of around 300 people. SCP captured all images using a balance of ambient light and speedlite on-camera flash where needed. SCP shot imagery of the winners receiving their awards, the 300-strong audience, and other on-stage activity. 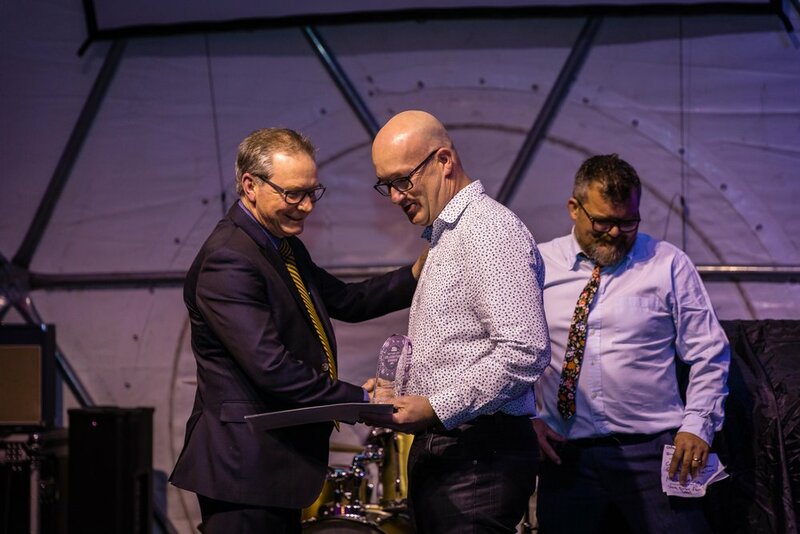 SCP also sponsored the category dubbed the 'Simon Cartwright Photography Outstanding Retail Award', which mean't Simon had to step out of his comfort zone, get up on stage, and present Thomson Suits with the overall most outstanding Hastings retailer award. After celebrating a whopping 61 years suiting and booting Hastings' high street shoppers, Thomson's Suits on Heretaunga Street definitely measured up for this brand-new award. SCP engaged fellow photographer Russell Taylor to assist in shooting the event. Simon and Russell arrived suitably early to scope the venue and also to get prelim shots. As guests arrived and mingled they took photographs in a candid and non-invasive manner. As guests and nominees had arrived and the formalities began, and MCs Councillor Wendy Schollum and Gerard Barron from The Common Room got the event underway, Simon and Russell photographed all the stage action from two angles. The winners were shot receiving their awards, and images were also taken of the winners posing with their category sponsor and award. "Being a purely commercial photography business, and working with a wide array of businesses across Hawke's Bay, at SCP we believe it was very fitting to be shooting such an event. It was a great opportunity to support local businesses, many of which SCP has worked with, while also promoting the great things growing here in Hawke's Bay."